The Rabbi with a Blog (Rabbi Jason Miller): Pray Ball! After reading the article in Tuesday's NY Times ("Rockies Place Their Faith in God, and One Another") about the emphasis the Colorado Rockies baseball team places on Christianity, I couldn't help but think about the devout Christian pitcher, Eddie Harris, from the movie "Major League." Harris has a famous line (one of so many in the movie) where he questions Pedro Cerrano's religious views: "You trying to say Jesus Christ can't hit a curveball?" The strong Christian values espoused by the Rockies franchise, according to the Times article, seem to focus more on "character" and less on proselytizing. 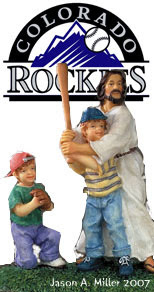 The role of Christianity in the Colorado Rockies clubhouse was first reported in a May 2006 USA Today article which described the team following a "Christian-based code of conduct" where certain magazines were banned from the locker room. Another article ("The Rockies Pitch Religion") soon followed in The Nation. Baseball, our American pastime, has long emphasized Christianity inside the players' clubhouse. The new issue of Moment Magazine has a long, well-written article exposing the Christian prostelyzation in Major League Baseball. In "Is the Nation's Favorite Pastime Pitching Jesus: It's a Close Call," Karin Tanabe explains what Washington Post reporter Laura Blumenfeld (daughter of Conservative rabbi David Blumenfeld) witnessed when she was in the Washington Nationals' clubhouse and chapel in 2005. The team chaplain, Jon Moeller, answered in the affirmative when a player asked if Jewish people will be doomed because they don't believe in Jesus. There was a public outcry and the chaplain was eventually fired. The article quotes my friend and colleague, Rabbi Ari Sunshine, who wrote a letter to Baseball Commissioner Bud Selig following Chaplain Moeller's comments. Rabbi Sunshine criticized Major League Baseball for only offering Christian worship to baseball personnel. The next day, Selig (who is Jewish) responded that he found Moeller's comments "disappointing and offensive" and that he will "take steps to insure that much of what you have written is implemented into Major League Baseball." Going into game three of the World Series, it wouldn't hurt for the Rockies to do some praying... so long as they can choose to whom their prayers are directed.